Elegant and picturesque Hanukkah lamps get the celebratory spotlight. 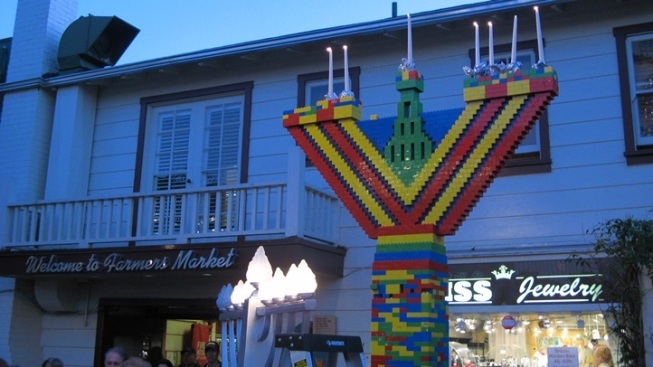 Families will build a large LEGO menorah at the Original Farmers Market plaza on Sunday, Dec. 1. There are many beautiful qualities to a menorah, but one of the most moving is how personal a design can be to a family. From the material used -- glass, gold, ceramics -- to the size, a menorah can represent much to a household, and serve as a starting point for conversations about what the family values most. Hanukkah lamps can certainly have a little whimsy, too. Take the LEGO menorah that turns up each and every year at the Original Farmers Market on Third & Fairfax. "Turns up each year" isn't quite right; rather, kids and parents build it, brick by colorful brick, until it is quite large, a happy hue-brimming symbol of the holiday. Want to place a LEGO or two? The Hanukkah Festival will take place on the north side of the historic market on Sunday afternoon, Dec. 1. The Skirball Cultural Center is celebrating the glorious menorah collection at its hilltop home during the Lights of Hanukkah Family Tour. There are two upcoming walk-throughs, one on Saturday, Nov. 30 and one on Sunday, Dec. 1, and both will cover the "stunning Hanukkah lamps in Visions and Values: Jewish Life from Antiquity to America." It's a fine way to see how history and time have shaped the lamps, and to learn details and stories. Paid center admission gets you on a tour. And if you want to be present at a nightly lighting during Hanukkah, there are a multitude of public menorahs on display around Southern California. Farmers Market, Santa Monica, and Beverly Hills are listed, but look to Burbank, City Hall, and Irvine, too.